All Building Kings’ metal garage kit steel arch building models are ideal structures for custom aircraft hangers. Steel arch buildings are the strongest, most cost effective and durable metal hangars for aircraft on the market. Metal Building Kings® understands the importance in protecting your aircraft investment and the need to have ample space and a reliable structure. Metal Buildings Kings® uses the best commercial grade steel from 14 to 22 gauge guaranteeing the most structurally sound steel hangar buildings you need. Every Metal Building Kings® metal building includes approved AZ55 Galvalume® Energy Star® color coatings with a 40 year warranty on your wall panels. This eliminates the threat of termites or mold, so there's never a need for fumigation or costly structural repairs, repainting or maintenance associated with other types of buildings. Our pre-engineered metal buildings are the strongest on the market and are industry certified buildings. 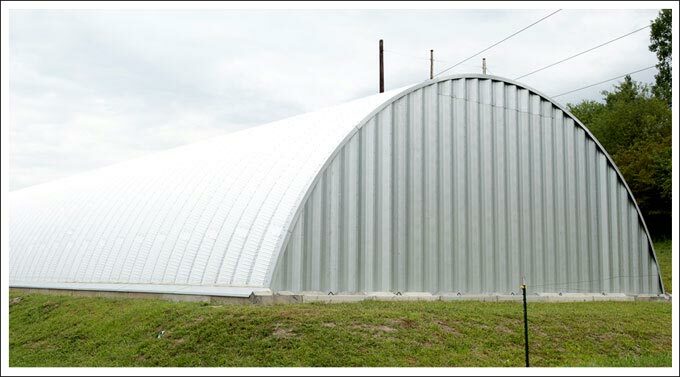 Our steel arch aircraft hangar buildings range from over 100 feet wide to 24 feet high with unlimited length to support wide clear spans and height for clearance. Unlike a straight wall I-beam rigid steel building, the arch pre-engineered metal building system is much stronger and certified up to 170 mph winds. We will custom manufacture your hangar’s door header beam with special attachment plates so your metal building assembly is done right. Our insulated bi-fold doors with electric operation are best suited for an aircraft hangar with total clearance from the ground to the top of the entrance opening. Our prefabricated buildings are engineered to be erected easily with minimal parts and no special tools needed. If you require complete turnkey construction of your project, our experienced contractor services department will assist you in getting the job done right or send field construction consultants to assist your local contractor. We are experienced in airplane hangar planning and construction as well as assistance in floor plans, permitting and local building codes. Our certified vendors can get you the best aircraft equipment and building essentials for your hangar. Store your crop duster, glider, helicopter, biplane, single engine plane or military aircraft in our solid steel hangar buildings able to withstand hurricane force winds and heavy snow loads. We assist clients in all 50 states with designing and constructing the ideal hangar for your application and working with your county’s building codes. With no beams or posts or trusses in your aviation hangar you have a 100% usable area inside. You can even add on to your hangar space by extending the length as you expand your fleet of planes in the future. With an easy to erect design, all you need to do it bolt the steel arches, angles and end walls together using the included hardware and our step by step instruction manual. Design your airplane hangar steel building with custom doors, windows, skylights and ventilation. Use our pricing calculator to design and build your hangar. We will help you construct the correct steel building foundation with a drainage system to have a clean environment for maintenance and cleaning. Our trained customer service representatives are always here to assist you. Add electrical, plumbing and maintenance areas for your technicians to service your aircrafts. Your Metal Building King arch building is coated with AZ55 Galvalume® - which is comprised of aluminum, silicone and zinc, a state of the art coating to help prevent rust and comes with an industry best 40 year rust-through perforation warranty and a 40 year warranty against peeling paint, flaking and loss of adhesion.